Josh Cobb’s superb 86 set Northants Steelbacks on course for their first win in the Royal London One-Day Cup as they slayed Leicestershire Foxes by 55 runs at the County Ground. Olly Stone also played a leading role as he hit an unbeaten 19 late in the Steelbacks innings and then took three vital wickets to destroy the Foxes’ reply. 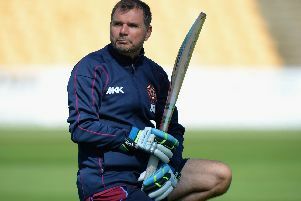 Northants had been comfortably beaten in their opening two matches, losing to Durham Jets last Saturday and being eviscerated by Surrey on Monday. But they bounced back well as the bowlers ensured the Steelbacks were able to defend their 244 for nine. Cobb, with good support in the form of Rob Keogh’s half century, helped them ensure a middle-order collapse did not prove too costly. And Stone then took three wickets in 14 balls to reduce the Foxes to seven for three, leaving them in a perilous position. Ned Eckersley made 71 for the visitors, but Steven Crook took three for 38 as the Foxes were eventually bowled out for 189. As they had against Durham and Surrey, the Steelbacks got off to a stuttering start after stand-in captain David Willey opted to bat first upon winning the toss. Richard Levi was bowled by Clint McKay in the third over for four, and Adam Rossington edged his second ball behind to leave the Steelbacks seven for two. But Cobb and Ben Duckett, batting at four in Alex Wakely absence, steadied the innings, adding 80 for the third wicket. In-form Duckett had hit consecutive one-day fifties and looked in good touch for his 30, lifting Rob Sayer for six over long-on in the process. But having later been dropped by Sayer, he tried to go big off Tom Wells and skied a catch to mid-off. Cobb continued his steady progress, completing a 68-ball half-century and in Keogh he found another willing partner as the pair negotiated the middle overs with few alarms. But having set a good platform, the Steelbacks wasted that with another middle-order struggle. After being 176 for three with 15 overs remaining, they went on to lose six wickets for 43 runs after Cobb, who hit 10 boundaries in his 110-ball innings, was trapped LBW by Charlie Shreck. Keogh competed his half-century, coming in 52 balls, but he couldn’t add to his score as he was smartly stumped by Northants old boy Niall O’Brien off Ben Raine. Just when they would have been looking to kick on, the Steelbacks stumbled as Willey drove Sayers straight to cover, Crook found the hands of deep midwicket for 10, and Rory Klenveldt was bowled. Seventeen-year-old Saif Zaib was making his One-Day Cup debut for Northants and he made a bright 16 before being bowled by Raine. But the last pair of Graeme White and Stone added 25 in the final 19 deliveries, Stone with two fours and a six in the final over, to drag Northants up to 244-9. With a below par score on the board, they needed early wickets, and Stone delivered exactly that. After being driven for four by Angus Robson, he found the edge and in the following over Mark Cosgrove slashed at a wide one to be caught at the wicket without score. Stone, who had previously taken three wickets in 12 one-day games, doubled his career tally with his 14th delivery, removing Aadil Ali’s middle stump. Kleinveldt was backing him up at the other end with four maidens in his first five overs, which cost just a single. Eckersley and O’Brien rebuilt the innings with a stand of 76 in 18 overs, but O’Brien then tried to cut Crook and edged behind for 34. Eckersley never got into his full stride, but anchored the Foxes innings, adding another 63 with Wells to keep the visitors’ hopes alive. However, just when the Steelbacks needed it, Crook returned to remove both inside the 37th over, first Eckersley chipping a simple catch to midwicket before Wells was LBW for 25. After his earlier tight spell, Kleinveldt got a deserved wicket as Sayers edged to slip, before debutant Michael Burgess charged White and was bowled for 13. Raine clubbed 24 off 16 balls but by that stage it was too little too late and he slapped Willey to cover before White wrapped things up, taking a diving catch running backwards off his own bowling off Shreck.